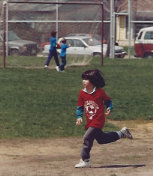 My red soccer jersey was my favorite tee-shirt when I was 7 years old. This was during the days before AYSO soccer uniforms traded cotton for synthetic fibers, which were hotter and scratchier but made us feel like professionals. My jersey had a large soccer ball screened onto the front under large letters, and during the course of washing out grass stains every weekend the paint began to crack until it became the softness that we refer to as “jersey” today. Right around the time of the switch to synthetic jerseys I hit puberty. Gone were the days of feeling soft cotton against my chest. Before top surgery I wore chest binders daily for seven years. Their 70% nylon and 30% spandex squeeze your chest into a livable contour. It feels like a hug, both in intimacy and safety. I easily spent close to 18 hours a day held in that embrace, sometimes 24. Red lines and abrasions were frequent, and on really hot days it was hard to breath. Like any undergarment, the outlines of the edges were traceable through a shirt, so layering was essential. Piling on undershirts, tee-shirts, button-downs, vests and jackets was fine in the cool summers of San Francisco, but became a health risk when I traveled to the tropics where temperatures commonly reached 100°F. Heat stroke is real and nylon doesn’t breath well. Keeping cool railed against peace of mind. Four weeks post-op the last of the bandages and medical tape came off and I left the house in only one tee-shirt for the first time. Unlike the loss of sensitivity that comes from wearing socks everyday, the tactile experience of feeling soft jersey cotton against my chest was present and unyielding. I can feel the breeze lifting the light fabric off my skin and running over my shoulders. Softness has a new meaning. Walking is nicer, focusing is easier, and at some point the feeling of cotton against my chest too will lose its sensitivity, and a new normal will arrive.